Providing you the best range of ammonia high pressure gas regulators, n2o high pressure gas regulators, two stage pressure regulator, single stage high pressure regulator, nitrous oxide cylinder regulator and line high pressure gas regulators with effective & timely delivery. High pressure single stage regulator with SS 316 body with SS 316 diaphragm with purge value for Ammonium gases. Stainless Steel Ammonia gas regulator with double gauge Ammonia Regulator is specially designed for pressure control of corrosive ammonia gases Application: This High Purity stainless steel Ammonia Regulator is used to regulator the high pressure gas cylinder or pipeline for required working pressure and ensure outlet pressure steady when input pressure and outlet flow change. 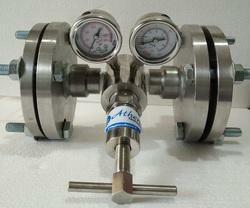 Material: Measuring system, pointer and case of the ss pressure gauge are made of high qaulity stainless steel. 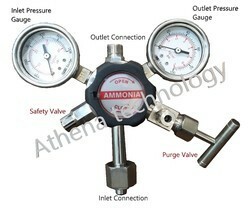 With sincere intentions to preserve and uplift our reputation in the market, we are offering a comprehensive assortment of Ammonia Gas Regulator. Our offered gas regulator is manufactured by our reliable vendors, used for regulating flow of gas. This gas regulator is made available in several sizes. Owing to its superb features, provided high quality gas regulator is mostly demanded in the market. Design Pressure 1.5 times working pr. With a focus on the ever-evolving demands of our customers, we have come up with a wide range of uniquely designed Two Stage Pressure Regulator. Our skilled professionals use premium grade components and contemporary technology in the manufacturing process of this regulator. To ensure its functioning and dimension accuracy, this regulator is duly examined against numerous measures of quality in accordance with defined industry standards. With a focus on the ever-evolving demands of our customers, we have come up with a wide range of uniquely designed Two Stage Pressure Regulator. Our skilled professionals use premium grade components and contemporary technology in the manufacturing process of this regulator. To ensure its functioning and dimension accuracy, this regulator is duly examined against numerous measures of quality in accordance with defined industry standards. Athena manufacturers various kinds of Regulators. Athena Regulators have been designed to meet the demand of High Purity Corrosion Resistance Product Specially Suited for low level PPM Moisture Two types of Cylinder Regulators available Brass Chrome Plated body with SS diaphragm and SS body with SS diaphragm. Regulator consists of inlet & outlet pressure gauges. Inlet pressure gauge shows the total pressure of cylinder and outlet pressure gauge shows regulated pressure. High pressure piston type Regulator & Regulators for corrosive gases like Ammonia, Chlorine, etc. are also available. Two types of Cylinder Regulators available Brass Chrome Plated body with SS diaphragm and SS body with SS diaphragm. Regulator consists of inlet & outlet pressure gauges. Inlet pressure gauge shows the total pressure of cylinder and outlet pressure gauge shows regulated pressure. 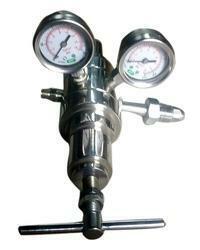 High-pressure piston type Regulator & Regulators of corrosive gases like Ammonia, Chlorine, etc. are also available. N2O Cylinder RegGas Two stage Cylinder Regulator Brass Chrome plated body with S.S.Diaphragm with Pre-heater Regulator consists of inlet & outlet pressure gauges. Inlet pressure gauge shows the total pressure of cylinder and outlet pressure gauge shows regulated pressure. 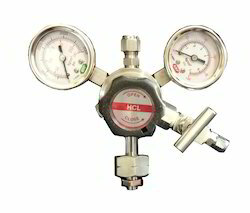 High-pressure piston type Regulator & Regulators of corrosive gases like Ammonia, Chlorine, etc. are also available. The Line High Pressure Gas Regulators that we give to our clients are a gas weight controller, used to decrease the weight of a gas chamber. These controllers can likewise be utilized as a part of the methodology line to a word related level, which makes it suitable for different supplies and procedure. Line controllers are made utilizing high-review crude material and quality tried on different parameters for assembling deformities & blemishes. Pipe Size : 1/4" 1/2" 1" & 2"
Ultra high-purity stainless steel regulators for use with semiconductor applications. All semiconductor industry applications requiring precise pressure control. Being a customer driven association, we are occupied with offering an unique gathering of Double Stage High Pressure Piston Regulator.Our gifted experts fabricate this controller by utilizing generally tried crude material and advanced engineering. Notwithstanding this, our offered reach is thoroughly tried by our quality controllers against differing parameters to convey a deformity free roaming at customers end. Also, the offered extent is widely increased in value by our customers for emphasizing variegated properties like simple establishment and sturdiness. Gas Cylinder Regulator. 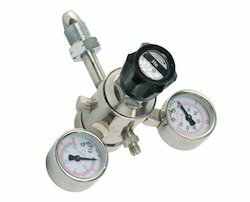 This regulator consists of inlet & outlet pressure gauges. Inlet pressure gauge shows the total pressure of cylinder and outlet pressure gauge shows regulated pressure. Only optimum quality components are used while manufacturing the offered range, for increased accordance with defined industry standards of quality. The offered regulator is widely appreciated among our clients for its durability, perfect finish and easy usage. 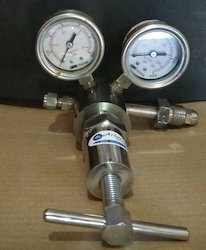 High pressure piston type cylinder regulator. 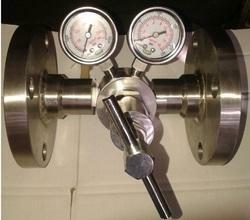 High pressure piston type cylinder regulator brass chromplated body. Inlet pressure gauge 0-280 kg/cm²Outlet pressure gauge 0-100 kg/cm² (as per requirement) & High pressure piston type cylinder regulator SS body. Inlet pressure gauge 0-280 kg/cm²Outlet pressure gauge 0-100 kg/cm² (as per requirement) Athena manufacturers various kinds of Regulators. 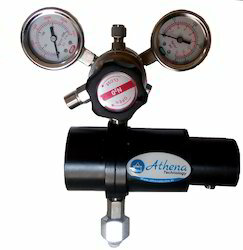 Athena Regulators have been designed to meet the demand of High Purity Corrosion Resistance Product Specially Suited for low level PPM Moisture Two types of Cylinder Regulators available Brass Chrome Plated body with SS diaphragm and SS body with SS diaphragm. Regulator consists of inlet & outlet pressure gauges. 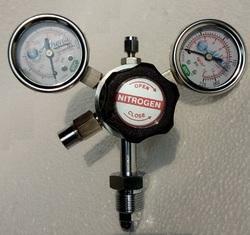 Inlet pressure gauge shows the total pressure of cylinder and outlet pressure gauge shows regulated pressure. High pressure piston type Regulator & Regulators for corrosive gases like Ammonia, Clorine, etc. are also available. We also have with us rich industry experience in successfully handling the demands of Gas Pressure Acetylene Regulators. We bring forth a wide array of high-grade Gas Pressure Acetylene Regulators that are highly efficient and best suited for the welding process. Our range of Acetylene Regulators is widely in demand in the national as well as international markets. This Acetylene Regulator is appreciated among its patrons for being shock-proof, durable, abrasion-resistant and affordable. Looking for Cylinder Regulators High Pressure ?